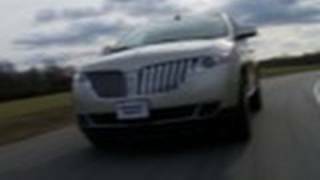 Lincoln MKX 2012 offers best-in-class standard horsepower (305) and torque (280 lb.-ft.) through a 3.7-liter V6 engine featuring twin independent variable camshaft timing (Ti-VCT) to increase power and fuel economy. 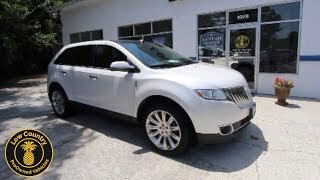 Industry-first customer-focused technology, uncompromised craftsmanship, top safety ratings and best-in-class horsepower and excellent fuel economy make the 2012 Lincoln MKX a standout among premium midsize utilities. Lincoln MKX offers an array of standard features that are often optional among luxury competitors, including heated and cooled seats, Lincoln SYNC®, MyKey®, and Intelligent Access with push-button start and Remote Start System. Recently, Lincoln received the highest score for long-term durability among all vehicle brands in the annual J.D. Power and Associates 2011 Vehicle Dependability Study and also was recognized as the leading luxury brand in vehicle satisfaction by AutoPacific. Lincoln MKX is also fuel efficient and delivers 19 mpg city and 26 mpg highway, best among non-diesel competitors. 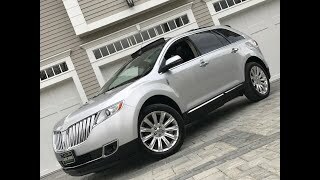 Safety is a key Lincoln MKX feature, and the model earned a Top Safety Pick from the Insurance Institute for Highway Safety for models built after February 2011, the fifth straight year the utility has earned this honor. To earn this ranking, a vehicle must offer electronic stability control as well as achieve a rating of “good” in offset frontal-, side and rear-impact crash tests and roof strength evaluations. In addition to standard electronic stability control, the Lincoln MKX premium utility features a solid unibody construction, which provides an energy-absorbing structure to help protect occupants. Bumper-to-bumper flow-through side rails, structural design and A-pillars are meant to better manage crash energy. Nearly half of the stiff shell is composed of high-strength steels, such as boron, for both increased strength and reduced weight. When a crash becomes unavoidable, MKX relies on an array of airbags and other technologies to help protect occupants. Two front second-generation airbags and two side airbags are joined by a Safety Canopy® consisting of side-curtain airbags for two rows of passengers. The first-row safety belts feature pretensioners and an energy management system with adjustable D-ring height in the first row. 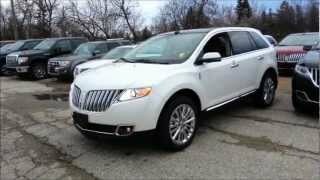 MKX was also the launch vehicle for Lincoln’s industry-first SYNC with MyLincoln Touch™ driver connect technology. This technology provides an intuitive, easy-to-use system for accessing a multifunction color display and infotainment color display. This technology puts customers in control of what they want when they want it – through voice, touch or a mix of both. Settings and controls can be personalized to the customer’s interests and level of engagement desired. Standard with MyLincoln Touch are two 4.2-inch color LCD screens in the cluster controlled by two five-way switches on the steering wheel and an 8-inch color LCD touch screen in the center stack. Lincoln MKX offers best-in-class standard horsepower (305) and torque (280 lb.-ft.) through a 3.7-liter V6 engine featuring twin independent variable camshaft timing (Ti-VCT) to increase power and fuel economy. 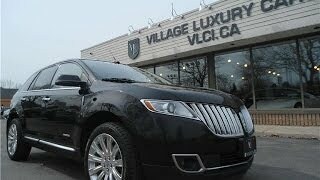 The Lincoln MKX is built at Oakville Assembly Complex in Ontario, Canada.